Any way you swipe them, dating apps and sites are digital packages of nerves, embarrassment, and frustration. But the numbers are too impressive to quit them. According to the Pew Research Center, 29 percent of adults know someone who met their spouse on a dating website or app. And nearly half of college graduates know someone who has entered a long-term relationship this way. 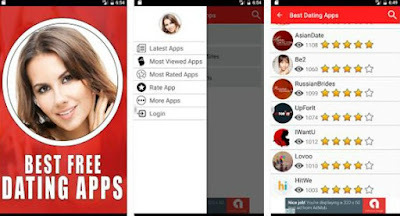 Knowing this, a team of developers gathered, tried tons of dating apps and sites and created one app that can help you find out which one to choose and maybe learn a few dating tricks and tips. The app is called Best Free Dating Apps, launched on the Android platform not too long ago. We loved its friendly user interface which makes it easy to use, then the great graphics and of course, the features which are well organized for easy access. Once you open Best Free Dating Apps, you will see that it is divided in three different sections: classification in categories and testing of dating sites, tips for online dating and online dating background information. All of them offer useful information about dating sites providers, ratings, opinions and reviews and many more. You can what are the differences between them, read news from the dating sites world, etc. You can download this amazing app from Google Play, where it is completely free of charge. Click the link below for more info.